SDS+ is the most common type of bit in the entire SDS system. 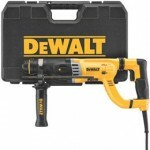 It’s one of the top choices you’ll see on a rotary hammer because it’s better at hammering than a conventional bit is. Although the SDS system was invented by Bosch and Hilti in the 1970s, you’ll find it on other brands of tools, too. And today we’re going to review rotary hammers from Bosch and Makita to see which one is the best. 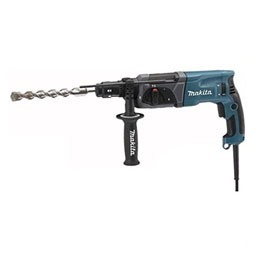 The Makita HR2470 is recommended for remodelers, electricians, masons, and other contractors that need to drill masonry or do light demolition of concrete. 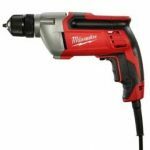 The 780-watt motor lets you power away at rock in three different modes, from hammering for chiseling, to rotation for drilling, and rotation with hammering, too. And since it uses SDS-plus bits, you have a wide range of accessories available for it, including chisels. The two-finger trigger, auxiliary handle, and ergonomic rubberized grips help reduce fatigue. There’s also a lock-on button to tackle big jobs. Since the HR2470 has a variable speed function, you can match the power you need to the material you’re working. It puts out up 1100rpm under no load, and up to 4500 impacts per minute. It also works in reverse at the same high speeds if you use the brush holder unit. And it has a safety clutch with torque delimiter to stop it from twisting in your hands if the bit binds. The HR2470’s maximum bit capacities are rated for different types of material. For example, it can handle a solid core concrete bit up to 15/16-inch. Steel is limited to ½-inch, but wood is rated for up to 1-1/4-inch bits. And you can swap bits using only one hand due to the SDS+ design. Finally, this is a rotary hammer made for professionals working in harsh environments. It has dust-sealed bearings and long-life carbon brushes in the motor. It’s also double-insulated for safety. 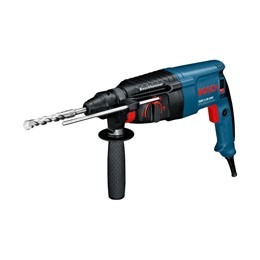 Let’s look at the differences between the Makita HR5470 and the Bosch GBH 2-26 DRE rotary hammer. First, the Bosch is rated for 800-watts and 2.7 joules of impact energy. That’s a bit more than the Makita model. But its top speed is 900rpm, which is slower. And it makes up to 4000 blows per minute, which is also a lower number. But it’s hard to say whether these small differences make one rotary hammer obviously superior to the other. Next, let’s look at maximum capacities. 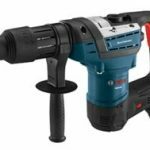 First, the Bosch GBH 2-26 DRE is limited to 1.02-inches, or 26mm when it uses hammer drill bits in concrete, or 2.68-inches (68mm) in masonry with a core cutter. That means it has a little more capacity than the Makita rotary hammer. With regards to metal, the Bosch GBH 2-26 DRE can handle bits up to .51inches, or 13mm. That’s equal to the Makita. And for wood, it works with bits up to 1.18 inches, or 30mm, which is a hair less than the other rotary hammer. So there’s not a clear winner here, either. But it is important to understand each tool’s limitations to make sure you get the one that matches the job you want to do. While you work, you can run the drill in reverse at the same speed because it has a rotatable brush plate. Also, you can halt the rotation while you chisel. And the overload clutch protects you and the motor by disengaging if the bit binds. Finally, you’ll notice that the Bosch GBH 2-26 DRE comes with an auxiliary handle, and both grips have a rubbery coating. That helps reduce the vibration you feel. And in this particular tool, the vibration has been tested to 17.5m/s2 while hammer drilling, and 9.5m/s2 while chiseling. In conclusion, the battle of the rotary hammers did not show a clear winner. Both of these rotary hammers are powerful tools, and they have very similar features. In the end, your choice may be influenced either by their bit capacities or else by their brand name. 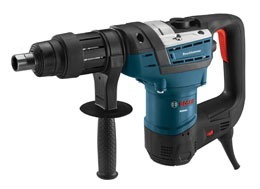 Click here to purchase Makita HR2470 on Amazon.com! 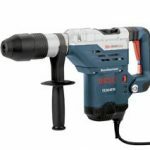 Click here to purchase Bosch GBH 2-26 on Amazon.com!